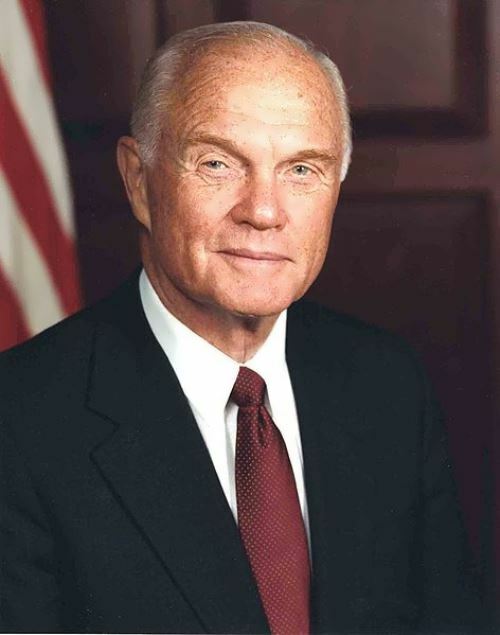 John Glenn was the first US astronaut to orbit the Earth, test pilot, Marine Corps pilot during World War II and the Korean War, Senator from Ohio. 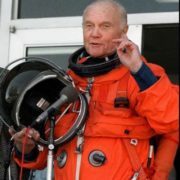 John Herschel Glenn Jr. was born on July 18, 1921 in Cambridge, Ohio. 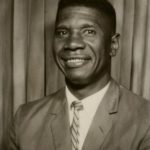 His parents had two other children who died in infancy, and they later adopted his sister Jean. 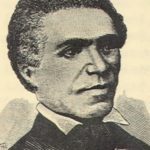 He graduated from primary and secondary schools in New Concord, then attended Muskingum University. In 1943 he joined Marine Corps. During World War II John made 59 sorties, flew the F4U Corsair over the Marshall Islands. 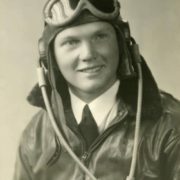 When peace came, Glenn remained in the corps, serving as a fighter pilot and then as a flight instructor. 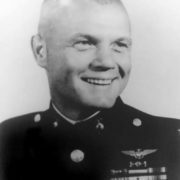 In 1952, Major Glenn was sent to Korea. 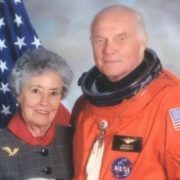 He participated in the Korean War and then graduated from the Test Pilot School. 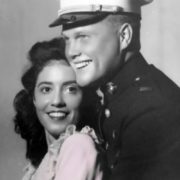 In April 1943 John married his high school sweetheart, Anna Margaret (Annie) Castor. 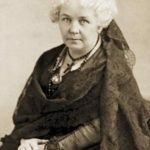 They had two children, John David and Carolyn Ann. 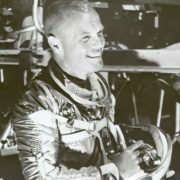 From 1956 to 1959 he served as a test pilot. At the same time, Glenn graduated from the University of Maryland. 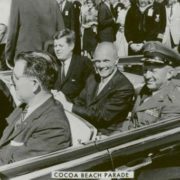 In July 1957, John as a colonel set a transcontinental speed record flight. It took him 3 hours and 23 minutes to fly from Los Angeles to New York. It was the first transcontinental nonstop supersonic flight. 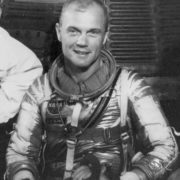 In April 1959, John Glenn joined the first group of American astronauts, the so-called First Seven. 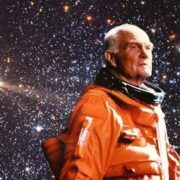 Glenn became the first American astronaut (and the third man in the world after the Soviet cosmonaut Yuri Gagarin and German Titov) to orbit the Earth. 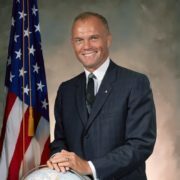 On February 20, 1962 he orbited the Earth three times. The duration of the flight was 4 hours and 55 minutes. 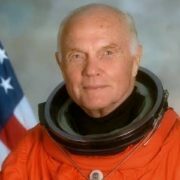 After a successful splashdown John Glenn became the national hero of the United States (he was awarded NASA’s Medal for Distinguished Service). The second flight was made on the space shuttle Discovery on 29 October – 7 November 1998. 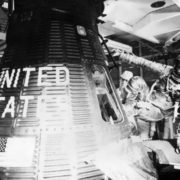 Discovery mission lasted 213 hours and 44 minutes. 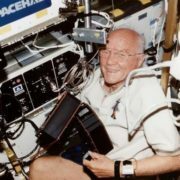 By the time of the second space flight, Glenn was 77 years old, so he became the oldest man in space. 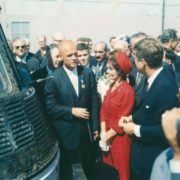 President John F. Kennedy admired the astronauts and became Glenn’s personal friend. 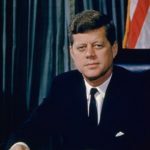 He advised Glenn to finish his Marine career and seek public office, but after Kennedy’s death Glenn’s political future became more difficult. From 1965 to 1974 Glenn was a businessman. 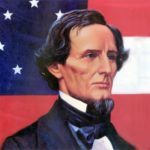 In November 1974, he was selected to the US Senate from the State of Ohio. 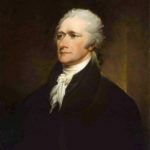 In 1984 he unsuccessfully sought the Democratic nomination for president. 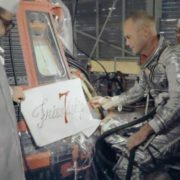 In 1990 Glenn was inducted into the Astronaut Hall of Fame. 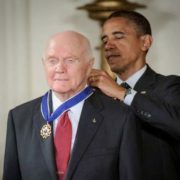 On November 16, 2011 he was awarded Congressional Gold Medal and on May 29, 2012 received Presidential Medal of Freedom. 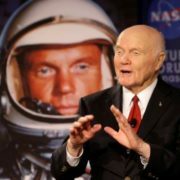 John Glenn died on December 8, 2016 in Columbus, Ohio. 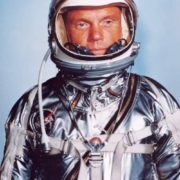 Ed Harris played the role of John Glenn in the film The Right Stuff.